Mirrors figure prominently in many design projects for the reason that they are not only beautiful accessories, but they can be practical design solutions. A mirror gives you the ability to reflect beautiful art or a sculpture, and it can completely open up u room. A mirror adds a special sparkle to a room, as a light source in itself. Beautiful mirrors evoke glamour and style as nothing else can. As an antique dealer, I am especially fond of French, Italian, and Spanish mirrors. In my showroom at the Houston Design Center, I consider mirrors to be a specialty item, and I admit that I have a borderline obsession about French mirrors and trumeaus. I am very particular about purchasing mirrors whether for myself or my shop. Whenever you shop for your mirrors, I suggest that you first judge the mirror by style, scale, and shape. Take a close look at the carvings to see if they are complete, beautiful, and intact. Next, look at the gilding to see if it is original, or if there are repairs or restorations; if so, how well have these restorations been done? I love to find original gilding with a bit of wear that shows the red undercoating. A mirror adds a special sparkle to a room, as it is a light source in itself. Beautiful mirrors evoke glamour and style as nothing else can. The “looking glasses” were imported front Venice and hung in the salons of royalty and aristocracy. The Italian mirror-making technique was a closely guarded secret, and craftsmen were isolated on the Woman island. Murano, prohibited from sharing the secrets of their trade, punished by death. Louis XIV who ruled from 1643-1715 was an enthusiastic importer of Venetian glass, using it to decorate his palaces. Italian mirror craftsmen were later smuggled into France to teach the French their secrets of making mirrors. 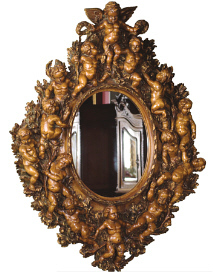 France produced their own mirrors at the royal factory, Manufacture Royale de Glaces et Mirroirs. Louis XIV purchased 700 mirrors for the Palace of Versailles! In the gallery, visitors could view themselves front head to toe -a real novelty for ladies and gentlemen of the day. Louis XV redecorated in the Rococo style, using many gilded and ornate mirrors in formal salons. By the time Marie Antoinette came to the throne in 1774, interior decoration with mirrors had been fashionable in France for over a century. She was delighted by the reflection of herself in the mirrors adjusting her gowns and towering wigs. The Venetians perfected the art of etching glass in beautiful floral designs and flourishes that decorate the borders of their mirrors. They added blown glass flowers and designs that enhance their beautiful shape. This type mirror has gained in popularity recently, and the antique ones have grown in rarity and price. When buying a Venetian mirror, check for chips to the mirror and attached scroll work as this type of restoration is difficult and time extensive. The silvering of your antique may have some cloudiness or have a few distortions. Don’t be overly concerned, as many antique dealers and designers like to see this gentle wear. Many designers that I know are asking mirror suppliers to “age” their new mirrors in an effort to achieve an antique look. Why not look for the real thing and enjoy seeing that gentle wear in your looking glasses Use antique mirrors over mantles And to beautify your entry way powder room, dressing rooms, and dining room. Full length mirrors are becoming popular to lean against the wall It’s fun to select a variety of sizes and shapes to fill an entire wall in a montage. After you have selected a mirror. I highly recommend that you hire a professional to move and hang the mirror, especially if it is heavy or over-sized or has fragile carvings. It is necessary to check both the wire on the back as well as the eve hooks on the sides to make sure they are strong enough to hold the mirror. Try to find wall studs for the hangers and use heavy duty hooks, If your mirror is oversized, I suggest a technique used with a wedged board applied to the back of the mirror and the wall. This application is a bit more complicated but a professional should know how to implement this type of construction. This will give you the best assurance that your treasure will not fall off the wall and break. Even it you don’t own a palace, it is fun to decorate with beautiful antique mirrors. In your decoration process, consider ceiling heights and wall dimensions. The size of your mantle or the furniture size should be evaluated. Take measurements in hand when shopping, so if you find a special mirror, you can easily determine if it will fit properly over a mantle or buffet. Take into consideration crown moldings and existing sconces for your mirror to fit between. Mirrors, through the ages, have been used to enlarge sizes and add beauty to interiors. Make Sure your mirror reflects a beautiful room and has a view worth repeating!